The Speeder by Jetpack Aviation could be the world's first jet-powered flying motorcycle. The Recreational Speeder is designed to be the first turbine-powered vertical take-off and landing (VTOL) aircraft ever manufactured. The fully stabilized nature of The Speeder ensures that owners can fly the aircraft with little to no pilot training. The aircraft does not need a runway for takeoff. It can take off and land on any flat surface and it can attain a flying speed of 150 mph. The aircraft is designed to fly at altitudes up to 15,000 feet above sea level although none of the target customers is expected to fly that high. 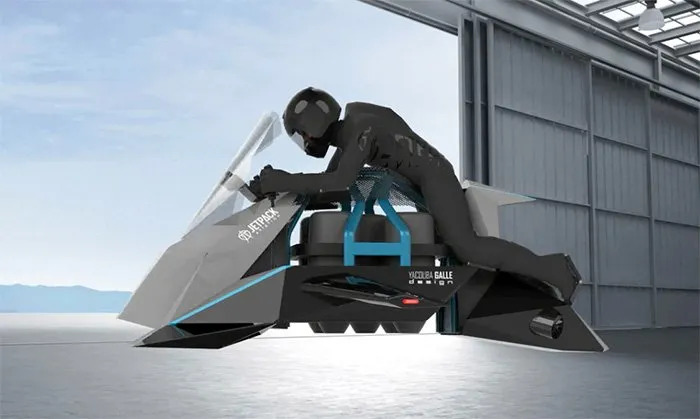 Jetpack Aviation announced that two main versions of the Recreational Speeder would be built: the Ultralight Version (UVS) and the Experimental Category Version (EVS). There is also a military version that is designed for application in war and emergency situations. The Ultralight version: This version is the one that would be made available to the general populace. It would not require a pilot’s license to operate and all training would be provided by the manufacturing company or any of their licensed training centers. The UVS would have a maximum flying speed of 60 mph and would only be able to carry 5 gallons of fuel. The Experimental Version: Only pilots with a private license would be authorized to fly the EVS and there would be no fuel or speed restrictions. According to JPA, individuals that preorder the EVS would be hosted in the company’s manufacturing facility and would have the opportunity of following the completion process. This move will be in accordance with the FAA rules surrounding experimental aircraft production. The Speeder is available for preorder on the Jetpack Aviation official website. The Recreational Speeder is currently valued at $380,000. The company plans to build only 20 units of the Recreational Speeder and you will need to make a deposit of $10,000 to confirm your order.